In the weeks leading up to the race, I was definitely feeling more nervous than excited. As soon as we landed in Cape Town, the energy of the city with runners everywhere was contagious, and my nerves calmed down (a little). On race morning, Sean and I found our corral and stood around with hundreds of other runners. I kept repeating to myself “I’m going to run 35 miles today,” trying to psych myself up. When I went to sync up my GPS watch, it wouldn’t turn on. Panic stricken, I looked at Sean and he laughed. We couldn’t fix it so he handed me his watch. I was really upset that my watch just conked out (I tested it 5 min before and it worked!). I asked Sean, “But what are YOU going to do without a watch!!? ?”… “I’m going to run,” he said– simple enough. Sean has told me a thousand times to be prepared for the unexpected in an ultra, and this was just a small example of what could happen. But man, I was grateful for his watch. The beginning of the race was dark and crowded, so I just concentrated on finding my rhythm. People were passing me like crazy, but I tried hard to stick to my own pacing plan. About a mile into the race, I heard someone breathing VERY loudly behind me, and I could hear his cumbersome footsteps. I thought, man it’s too early in the race for that dude to be working so hard! Then he passed me and I noticed he was running on a prosthetic leg. So awesome. My race strategy was to relax and not think about the total distance of the race. First challenge: Chapman’s Peak at mile 18. I felt strong, thanks to training at altitude (and on hills with the Swaras! ), and was able to run almost the entire thing. At one point on the hill, a woman was standing in the bushes playing Mama Mia on the violin! This was not an easily accessible spectator point so she must have hiked up there. Runners applauded her and sang as they went by. The road snakes right along the coast, and we had gorgeous views of the mountains and water the whole time. The descent was extremely windy, and much tougher than I expected. Luckily, I tucked in with a running club and stuck with them to block the wind on the way down. They were also doing a great call and response cheer: “Yehbo!! (yehbooo) This is easy!! (Easy!) Yehbo! (yehbooo) this is nice nice! (Nice nice! )”– it was exactly what I needed to hear because my legs were tired from the push up, and I needed to remember to enjoy the descent, even though it hurt. 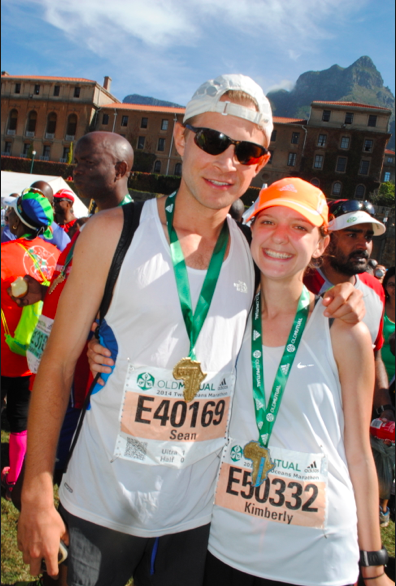 I rolled through Hout Bay, got some coke (my new favorite running fuel), and made it to the marathon mark in 5:03. My goal was to be there between 5:00 and 5:05, so at that point I felt like the plan was coming together and I could finish this thing. The next big test was a steeper hill called Constantia Nek. I walked that hill more than I would have liked, but still felt like my timing was okay. From the top of Constantia, it’s 6 miles to the finish. Now was time to push. I had to seriously concentrate for the last 4 miles, but then I finally saw the University of Cape Town rugby field. Adrenaline took over; I gunned it to the finish, and heard Sean scream as I ran by. I finished in 6:50:35– right before the final cutoff of 7 hours. Four years ago, I couldn’t run a mile. Seriously. It is still completely mind-blowing to me that I ran my first ultra… and even crazier that I’m considering longer races in the future.